By Mike Lawrence and Fred Gitelman. This software begins with an extensive discussion of the System and follows with a huge quiz section that shows you the System from opener’s and responder’s point of view. In recognition of the fact that you have busy opponents, there are quizzes showing how to cope with competitive auctions. 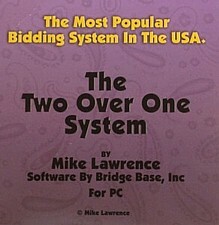 In addition to the Two Over One System, you will find a number of full explanations of conventions that are optional but which Mike highly recommends you add to the system.